Easter was the last holiday treat project. The volunteers from Assistance League made individual candy bags with chocolate bunnies, Easter eggs, and cookies for each child. And to work off all of their energy, the children will receive a huge basket with footballs, jump ropes, and other outdoor play equipment. 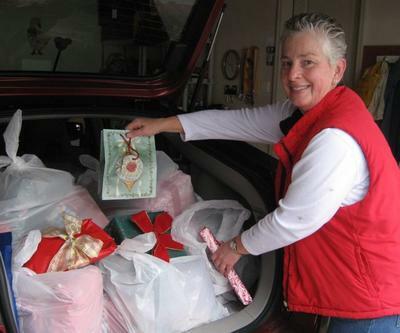 Barbara Lilley loads her car trunk with Christmas gifts she and Sherry Gongaware have purchased for the single women at the Crisis Center. The children always receive special treats, but the women are often left out. Thanks ladies for your thoughtfulness.